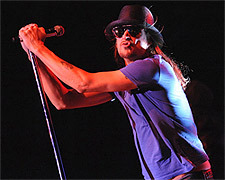 Five-time Grammy winner Kid Rock has entertained fans since the late 1990’s. The singer/songwriter and musician from Michigan is known for a versatile music style that blends his rock, country, rap, and blues influences. He recently released his latest album, aptly titled Rebel Soul, to rave reviews and is now on tour to promote it. Kid Rock has invited Buckcherry and Hellbound Glory to join him for this full-scale, arena tour! You can bet this will be a show to remember. The following events and venues match your search for “Kid Rock”. To sort the list, click on the column header. To find tickets for the given event, date & time, click the tickets link in that row. To find events taking place at a matching venue, click that venue name. RT @JSchabl: It’s still blows my mind that Chris Rock and Kid Rock are brothers.